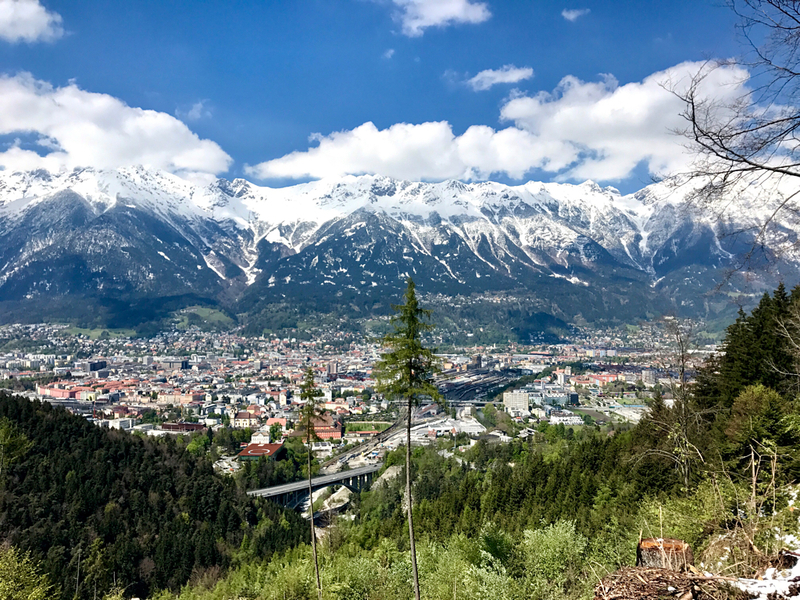 Innsbruck is, with almost 150.000 inhabitants, the capital city of the austrian state Tyrol and Austria’s fifth biggest town. With it’s perfect location right at the river Inn and surrounded by the high mountains of the Nordkette, which are part of the Karwendelgebirge seperating Bavaria in Germany and Tyrol in Austria, it is a very well known destination for outdoor lovers of all kind. Next to biking, climbing and classic hiking, it it also an interesting location for trailrunners. The trails around Innsbruck range from easy, relatively plain cart tracks to very technical, alpine paths up to over 2000 meters. It’s possible to start right from the city centre, or one can take the Hungerburg- and/or Nordkettenbahn to already start at a higher altitude. All the options offer great trails and views, with the panorama getting better the higher you get. Race briefing the day before the big day! Only one more minute till we go off! The IATF 2016 was a big success already, but this year over 1.400 runners are attending the event, making the IATF one of the biggest trailrunning events in the Alps. There are five distances (K15, 25, 42, 65 und 85) on offer and we are running the Trailmarathon with 42km and about 1300 altitude meters. The start of the K42 is where the K25 finishes and both together build a loop, the K65 distance – so this year we’re completing the loop with the second and longer part starting at Natterer See and finishing in the heart of Innsbruck at the Landestheatervorplatz. As last year, the weather on raceday is just perfect and shuttle buses take us from the city centre to Natterer See, where a second race briefing (The first one was the evening before at the festival area) is hold. We meet some old friends from our Obstacle Racing Team Munich Elite Warriors at the start and as “The Eye of the Tiger” rings out, we’re off on the course. The first checkpoint and food and drink station is called Bierstindl and makes us think about beer and brezn, but as we’re only around 8k in the race and not very exhausted, we pass by the first stop. The next 10k take us out of the city and over a slightly elevated and never steep hill to Ampass, where the second checkpoint is waiting for us. This section of the course comes up with some lovely forest trails and a very playful route, of which almost all parts are “runable”. As we’re no trained runners, we really struggle to run for longer distances, or above that we struggle to run steep or longer uphills, but the trails here are very welcoming for us. In Ampass we refill our water and take a little longer break to enjoy some oranges and cheese. A LOT of food and drinks at the checkpoint: YUMMY! Nevertheless we know there is only one way to finish – and that’s the way UP! At aDLER’s Hotel Innsbruck you are not only right in the centre, but also have breathtaking views over the city and its surrounding mountains not only during breakfast and dinner, but also from your room. The next day is just walking around, relaxing and taking many breaths of fresh air in the lovely old town of Innsbruck. We know the city quite well, but it’s always nice to explore some more corners of the capital of Tyrol. 🙂 The Innsbrucker Hofgarten is very welcoming with its fresh and green grass and from here we just gaze at the snow-covered mountains we ran around yesterday. All in all we had a perfect trailrunning weekend and the start into the season couldn’t have been better. In friendly cooperation with Innsbruck Alpine Trailrun Festival and Innsbruck Tourism. More information: www.innsbruck-alpine.at and www.innsbruck.info – thank you!